Current favorite accessories [Part 2/2] | Memorable Days : Beauty Blog - Korean Beauty, European, American Product Reviews. This is part 2 and the last part of my current favorite accessories. 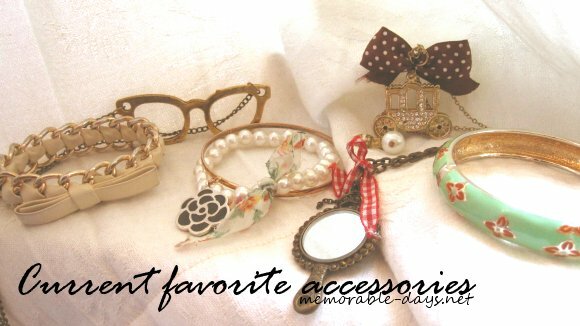 Check out part 1 here: http://www.memorable-days.net/2011/01/current-favorite-accessories-ribbon.html :). All accessories are bought in stores while I was in Shanghai ^_^. I can't wait to go back there! There are lots of online stores selling these kind of accessories in Holland, but I do think that the selling price of it are way too high, since I know how much they are worth lol. I really like the golden carriage xD it made me think of Holland when I bought it =P. Hope you like my collection ^o^. Awsh ze zien er echt heel leuk uit! @jennifer, yesss i like antique/vintage style =D hihi..
@liesewiesje, thank you ^^ ! @Tricia, haha i love all of them ^^ ! I really love the carridge one too! They are all so pretty thou! @Bibi, Julie & Bunny, Ahwww thank you ^^ ! !